The right makes itself look stupid whenever it tries the "hypocrisy" argument by saying that politicians like Nancy Pelosi live in houses surrounded by huge walls, thus undermining their "walls are immoral" argument. 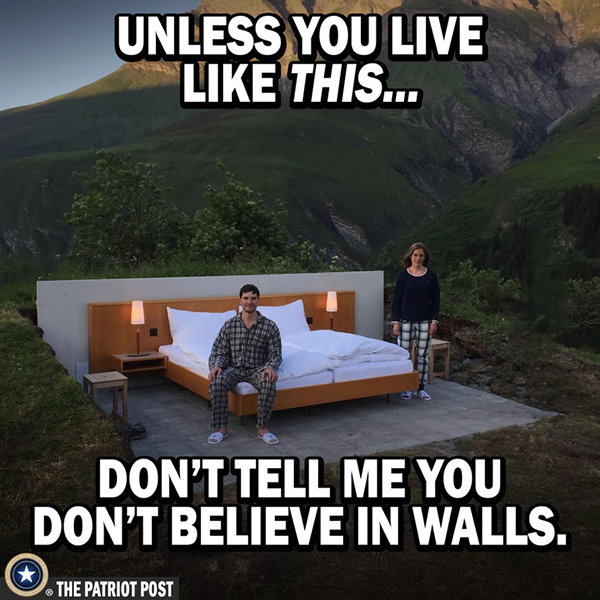 Does Nancy Pelosi, in fact, live on a property surrounded by walls? There's some doubt about that,* so why risk making a gaffe in an attempt to demonstrate hypocrisy? Hell, you could go further and note that your cells have walls! Try living without cell walls! Like it or not, differentiation and separation are necessary ingredients for existence and coexistence. We can't, don't, and won't all blend together into some sort of mystical alloy. America is a salad bowl, not a melting pot. *Yes, conservative readers, I'm aware that Snopes is considered leftie propaganda, and maybe that's what it is. Just focus on the purported facts and not on the source of the information. Committing the genetic fallacy doesn't make you look smart.